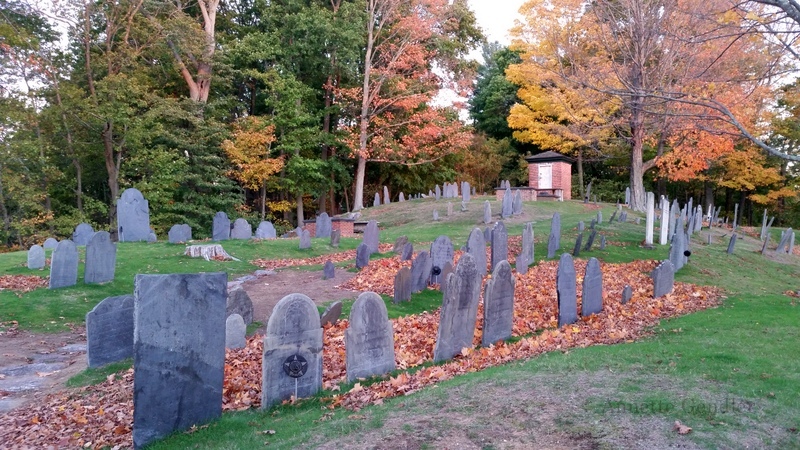 While we were visiting Minute Man National Historical Park last weekend, we stopped for lunch in the nearby colonial town of Concord, where I noticed two old graveyards in the middle of town. 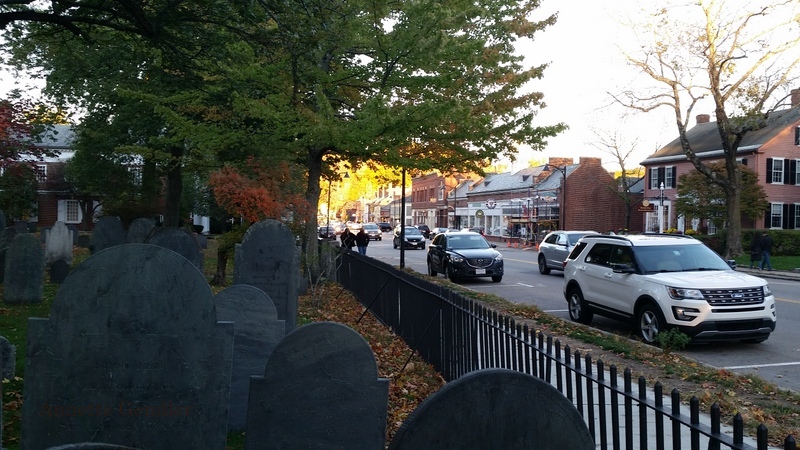 So after we returned to Concord from the musket firing demonstration and had some time before dinner at the Colonial Inn (dating back to 1716), my daughter and I poked about the graveyards at dusk. Just the right kind of thing to do at the end of a crisp and glorious autumn day. 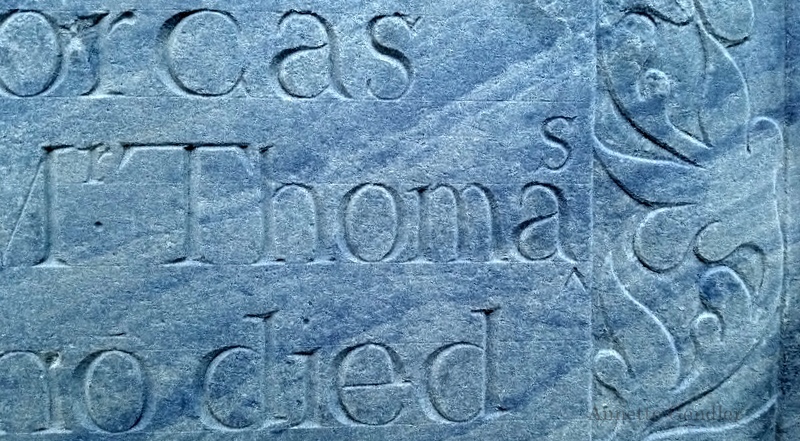 And what writerly curiosity did we spot on one of the gravestones? An error that had been corrected as if someone had just proofread the engraving, inserting a caret and the missing letter. First we thought this was a unique occurrence. Turns out, it wasn’t. 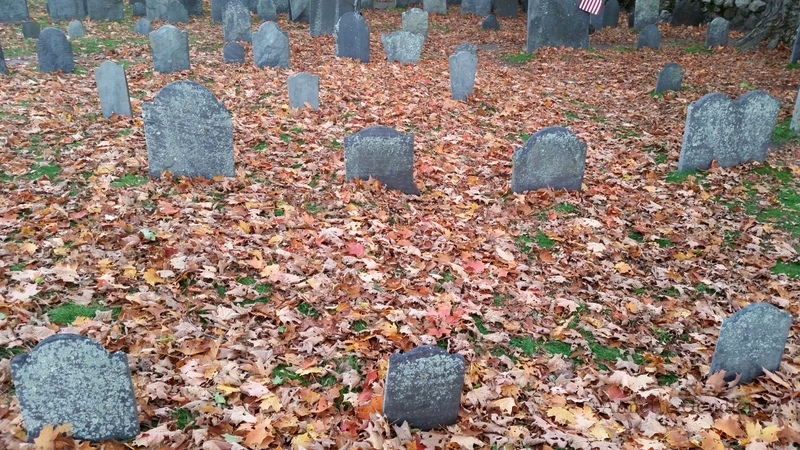 After thoroughly exploring the graveyard by main street (I can’t find a name for it on maps except “cemetery”) – many of the graves dating back to the 1700s; I even found one from 1697 – we also walked up to the Old Hill Burying Ground a few blocks away and inspected the inscriptions there. 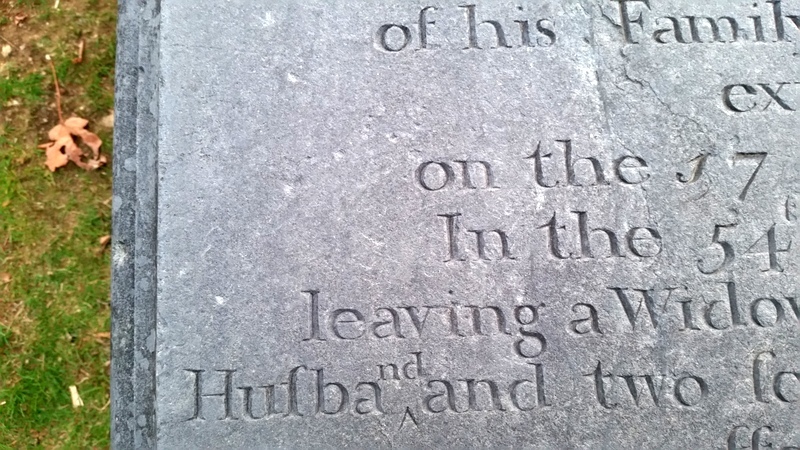 On one sarcophagus from 1781, I found this correction of “husband.” We were also intrigued by the unique long letter that showed up on many graves for “s” as seen here in “husband. It looks like an “f;” in fact, it seemed indistinguishable to us from a lowercase “f.” Upon closer study, I figured the long “s” was used inside of words, while the “s” as we spell it today was used at the end of words. I’m not sure if my assessment is correct, but that’s what I found. If you know anything about this, let me know! 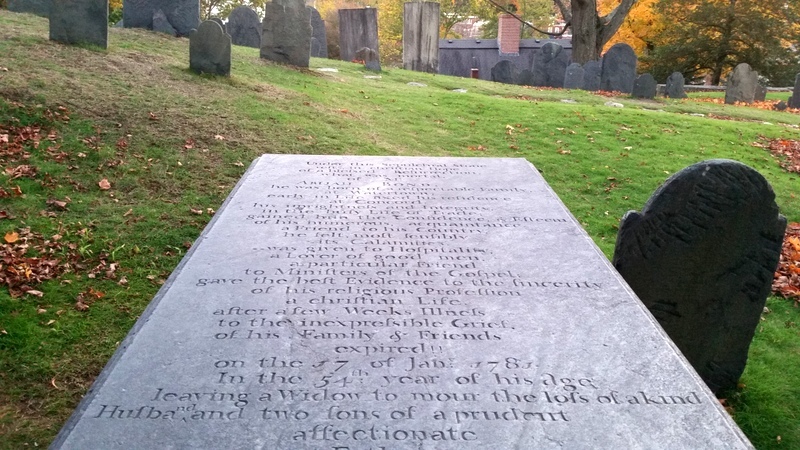 I appreciate the homage to the dead, and how life is distilled to milestones on gravestones, and most often just to the beginning and the end. 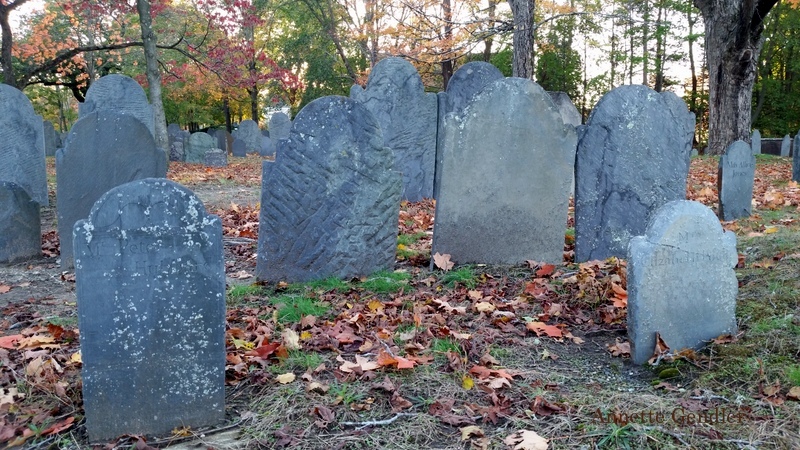 In fact, many of these old gravestones only noted the date of death; perhaps the exact date of birth was unknown. 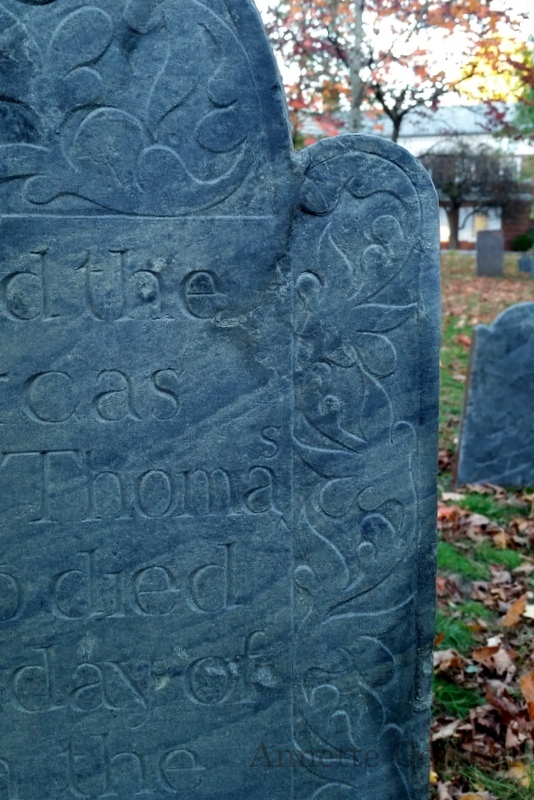 I appreciate that people used to take the trouble to carve gravestones and maintain them (the one with the husband error certainly is a newer copy, I doubt a horizontal engraving would look this good after 235 years. 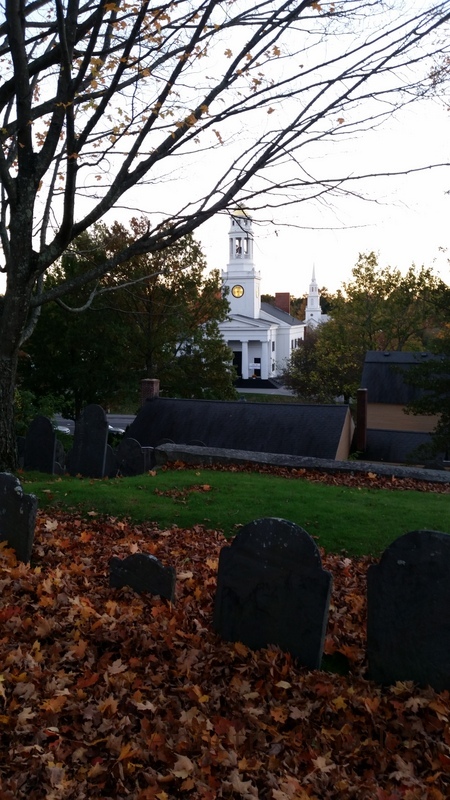 And I found it oddly comforting that these graves have been in the midst of a thriving town for all this time and that this Old Hill Burying Ground also afforded the visitor a nice view of this picturesque town. Not sure yet if I’m done with graveyard blog posts because I have another cool one I could put together from my last trip to Israel, but in any case, I thought this one makes for a nice Halloween post. 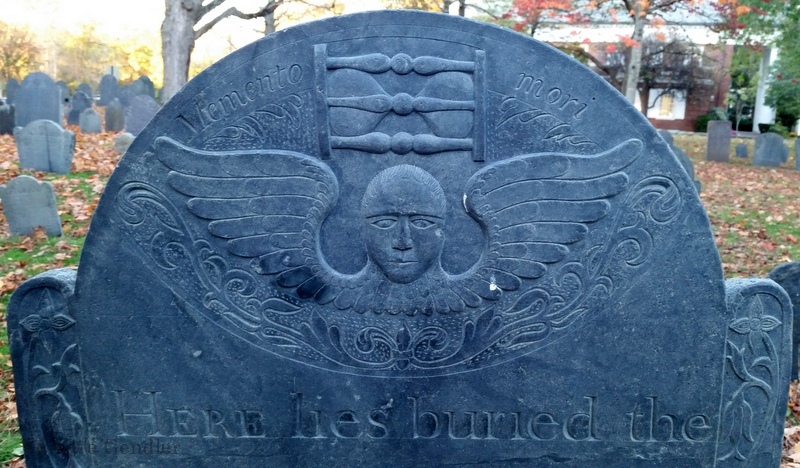 So, Happy Halloween, and do let me know if you can enlighten me on gravestone engravings (and corrections)! 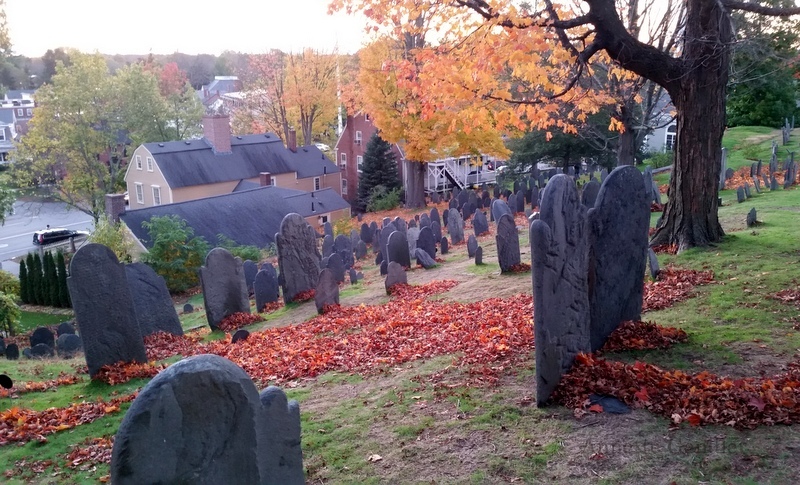 Thank you, Annette, for sharing your recent experience in this New England cemetery — replete with lovely autumn photos! 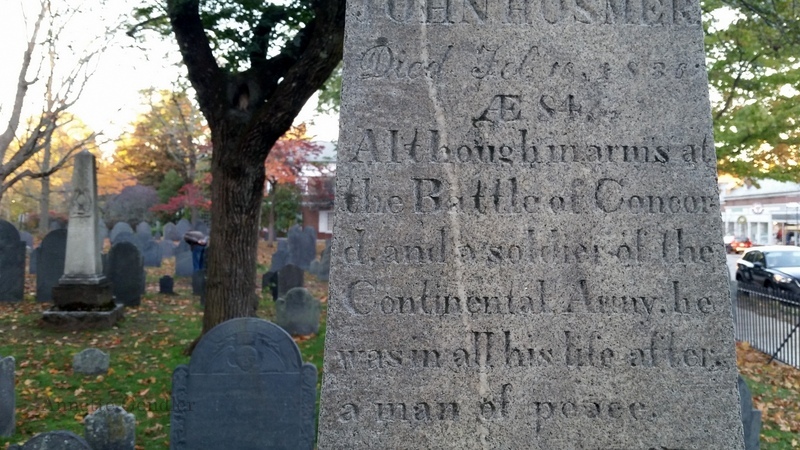 What an interesting (and I would have thought, unusual) find — the errors and corrections on some of the gravestones, that is. Those long "s's" that look more like "f's" remind me of Gothic German or even Old English. 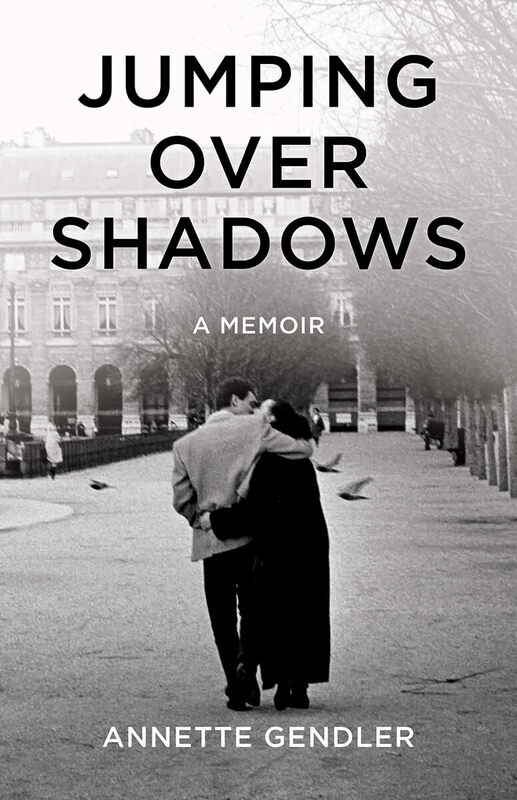 Perhaps that is where the influence originates. I wish I could shed further light on this mystery, but unfortunately I can't. In either case, a Happy Halloween to all! 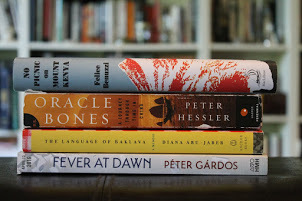 Rivka, yes, the long s reminded me of Gothic German letters as well – I still have plenty of books in the old German print. I taught myself to read them as a kid but to see it appear in English struck me as a bit odd, albeit perhaps not so surprising. Yes, what looks like f is an old version of s. You do see it in old documents, but the language itself evolved out of that, so for the last two hundred years plus, it's been gone from use. our old area — a perfect time to be there. 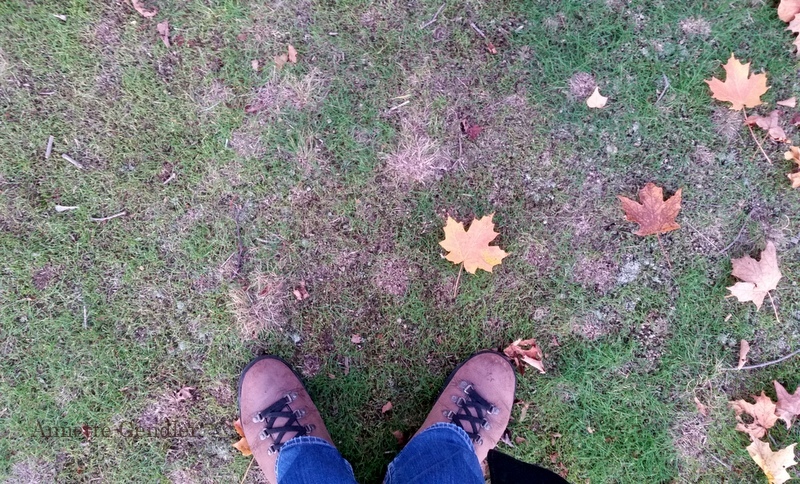 Did you get to Walden Pond, too? Charlie, we didn't make it to Walden. My daughter balked at that, she's not a Thoreau fan.